A Brazilian company is using 3D prenatal imaging technology and 3D printing to produce physical replicas of a baby growing in the womb, allowing moms- and dads-to-be to hold a model of their unborn child in their hands. Neva Fairchild of the American Foundation for the Blind told Tech Page One that the models would be of great benefit to the visually impaired, who otherwise would miss out on the experience of seeing their loved one’s unborn child develop. “Fifteen months ago, my first grandchild was born and they had numerous sonograms and I missed out on all of that,” Fairchild said. The Tecnologia Humana 3D company was founded by Jorge Roberto Lopes dos Santos of the Brazilian National Institute of Technology to develop projects and research in the areas of physical and virtual three-dimensional modeling. Dos Santos’ “Feto 3D” project was initially created to help doctors diagnose medical problems in the pre-born, but he soon realized the technology had wider appeal and could be used for parents to have a model of their child rather than just an ultrasound picture. The technology is not only able to produce an exact replica of the external features of a child in the womb, but can also explore the inside of the body and produce models of organs and the skeletal system. Dos Santos said he hopes to keep the cost of the technology low enough to be affordable for parents, with a model of a life-sized baby at 12 weeks costing about $200, and $300 for a model of a 24 week-old unborn child. Gorgeous. I would have loved something like this when I was pregnant with my son. 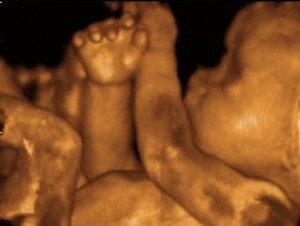 In one of his ultrasounds, he was rather obviously smiling, and to have that captures in 3D would have been great.